Faith is walking forward even though the view is foggy. 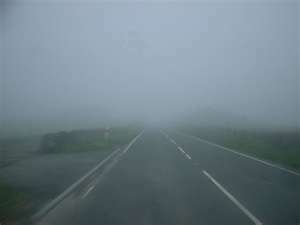 Growing up in Indiana you were guaranteed a certain number of school delays due to fog. This was great for us kids. We would go outside and run through the mist enjoying the soft wet cloud cover. As you grew up the reality of foggy danger set in and suddenly, it was not such a welcome to your day. Once I remember traveling back home with my family to visit my parents in Indiana and we hit fog about an hour from their home. The further we traveled the darker and more dense the cloud cover became. We were going forward at a rate of 5 miles per hour and praying for safety. The headlights were no help as they only caused a glare. We hoped we would not run into someone ahead or worse … that some careless driver would come from behind at a high-speed and hit us. Today we have fog here in Florida. What a surprise. I haven’t seen fog this thick in years but nevertheless, here it is. It reminded me of the fear I experienced driving through fog back home. I asked myself what was the real fear of not being able to see what’s ahead? I am a person who plans ahead. I must have all my ducks in a row, all my files organized, my day planned or I will not be able to function properly. Sometimes I drive my husband crazy with my planning. Before I drive any place new, I get on the internet and locate it on the map, print out the directions and I take my GPS with me. Am I too structured? Maybe. However, I’ve learned through the years the secret of overcoming “fear of the unknown”. I read in Hebrews 11, “by an act of faith, he turned his heel on Egypt, indifferent to the king’s blind rage. He had his eye on the One no eye can see, and kept right on going.” (MSG) This was Moses, the great leader, making a decision to go forward even though he couldn’t see what was ahead. He knew the one that called him was leading him to a better place. A place of peace and abundance of life. It wasn’t easy but he obeyed and followed. In life our journey goes along curvy, bumpy, low and high places. Most of the time we see clearly or at least can see what’s coming at us from a distance. When the path becomes cloudy, we experience panic, frustration, fear and loneliness. If we put our trust in “the One no eye can see” we will see beyond the fog. He promises to guide us through to the other side where the sun shines brightly. He knows what is beyond the fog and going through the fog builds our trust in Him. As I look outdoors, I can see the fog has lifted and a bright spot of blue appears in the distance. I’ve had many foggy days, spiritually speaking, and some are more faith-filled than others but I’ve learned that He never leaves me in the fog. This entry was posted in Quiet Places and tagged courage, faith, fog, trust by Dee. Bookmark the permalink.